The Amity Spartans were on the road in Milford for a game against the Foran Lions on Monday. 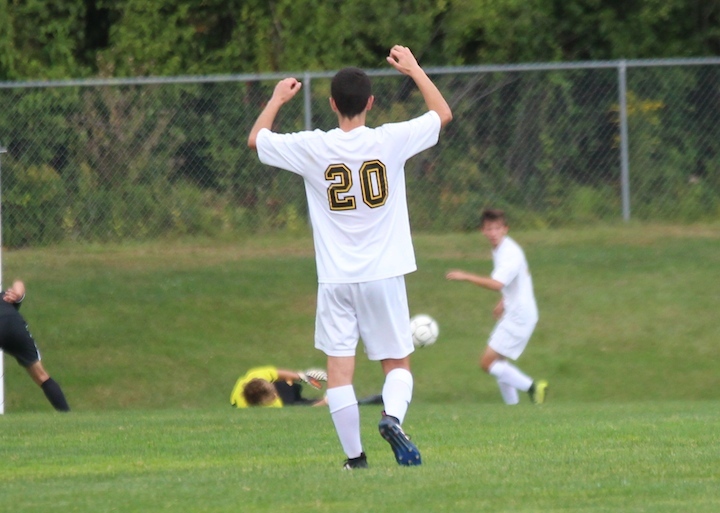 In the first half, Ali Bobi scored a goal assisted by Dean Saracino, giving Amity a 1-0 lead. The second half saw some more action, with the Lions’ Caleb Tondora tying the game with a penalty kick. 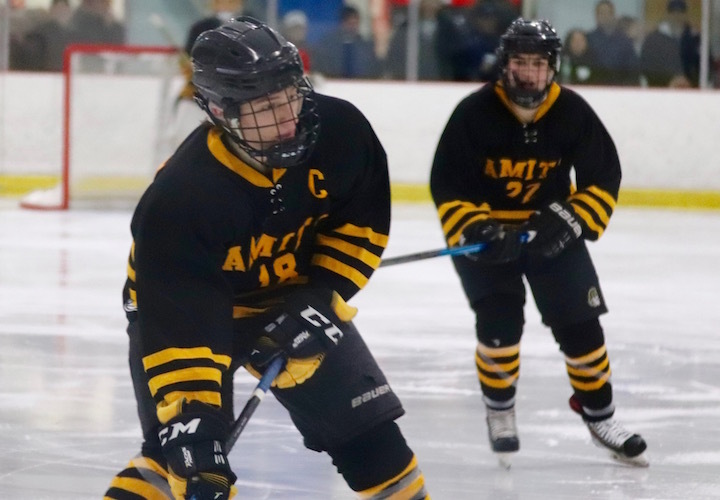 The remainder of the game was all Amity: Austin Gilbride made an unassisted goal, 15 minutes later Arian Bobi also made an unassisted goal, followed by a second Ali Bobi/Dean Saracino goal just two minutes later. The Amity Varsity Football team has a new coach, Craig Bruno, and with one very impressive 26-8 win under their handsome new jerseys, they give us hope for a successful season. This year’s team includes 10 seniors. #3 Daniel Beckwith, RB; #10 Jacob Lettick, WR; #22 Michael Young, WR; #30 Andrew Kimball, RB; #33 Gabriel Lipsitz, LB; #34 Brendan Messina, LB; #41 Brenna Dimauro, RB; #72 Ryan Biagetti, OL; #78 Justin Griffin, DL; and #89 James Van Hise, WR. #4 Jake Forchetti, WR; #5 Abyan Nawaz K/P; #9 Jamie Genovese, CB; #12 James Laubstein, QB; #13 Andrew Gnidula, LB; #20 Jack Figuly, CB; #25 Samuel Sachs, RB; #40 Alexander Ablozhey, WR; #42 Jeremiah Schmidtke, LB; #45 Nicholas Bevvino, RB; #50 Daniel Cavanagh, OL; #58 Joseph Digello, OL; #61 Sam Papelo, OL; #64 John Healey, OL; #73 Janek Olofsson, OL; #81 Nico Semmonella, WR; #83 Gabriel Morin, RB; and #85 Aedan Loynsky, WR. #19 Max Dempsey, QB; #28 Shaki Gray, SS; #46 Aidan Massa-Vaspasiano, LS; #52 Colby Fantarella, OL; #54 Anthony Olenechuk, LB; #55 Kyle Behnke, OL; #70 Laurence Lambiase, OL; #74 Carter Correia, OL; #76 Anthony Vega, OL; #77 Justin Miller, OL; #80 Daelyn Boscarino, WR; #82 Spencer Buynak, WR; #84 Jonathan Levit, WR; #86 Benjamin Iwaszkiewicz, WR; and #87 Ryan Buda, WR. The team also includes one freshman who made the cut, #88 Eric Santangelo, LB. For those who are not familiar with footballese here’s the magic decoder for the above mentioned Acronyms: K/P = kicker/punter; RB = running back; WR = wide receiver; OL = offensive lineman; LB = linebacker; QB = quarterback; SS = strong safety; CB = cornerback. 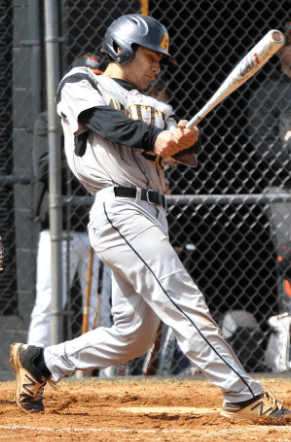 The Amity Spartans Baseball team was on the road in Shelton on Saturday for a matchup with the Gaels which had been postponed due to weather. With Ben Lodewick on the mound and Pat Winkel behind the plate, Shelton only managed to get one run in. Amity leads 2-1. The second inning was Amity’s time to shine, they added 6 runs to Shelton’s 1, pulling even further ahead. Second Inning score 8-2. Amity saw a lot of action in the fourth, adding four more runs (Gaels’ Will Ciccone pitching) yet Shelton didn’t have any further success (Spartans’ Will Rotko pitching). The game went on for two more innings (Shelton putting Mike Kennedy on the mound in the fifth) with no advancement on either side. Amity wins 12-3. Amity: Pat Winkel went 3-3, 3 walks, 2 doubles, 3 runs, 1 RBI; Jack Nolan went 2-3, 2 runs, 3 RBI, 1 walk; Quinn Burke went 3-4, 2 runs, 3 RBI. 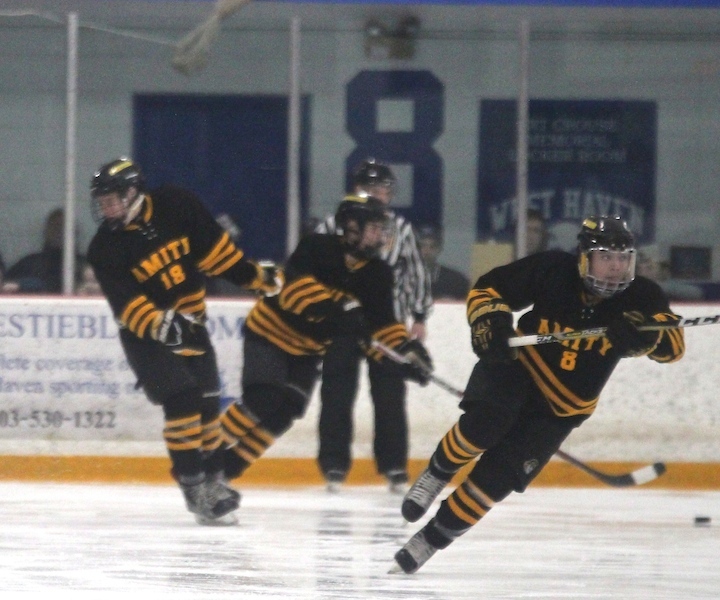 The West Haven Blue Devils hosted the Amity Spartans at Bennett Rink on Wednesday, Jan. 10. West Haven’s Kevin Moriarty tied things up at 1:27 on an assist from Robbie Forleo; Then halfway through the period Amity’s Connor Bath assisted by Mike Miller and Joe Schittina pulled the Spartans ahead again. 2-1 Amity. At 12:52, Amity’s Blum and Csejka teamed up again to score the third and final goal of the game. 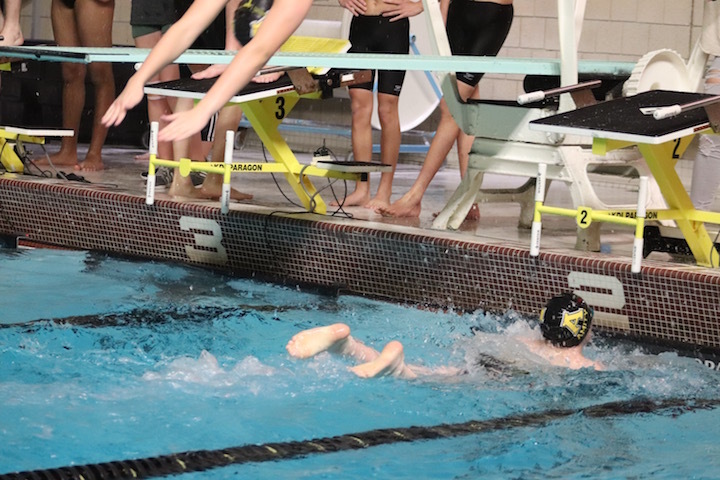 Records—Amity 5-1; West Haven 2-5. 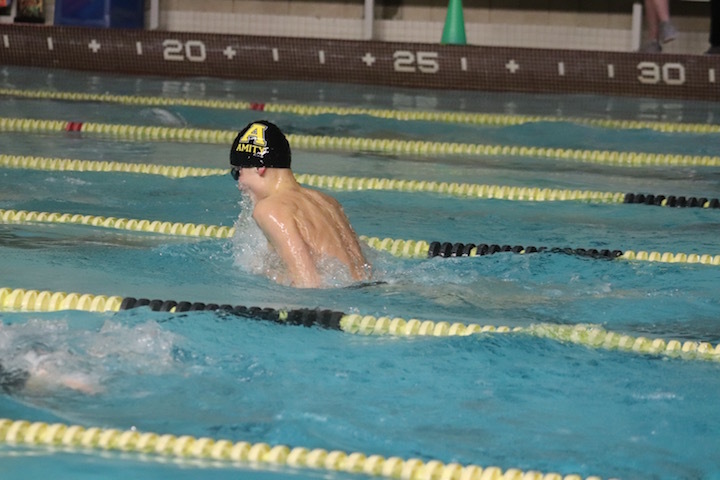 The Amity Boys Swimming and Diving Team was on the road in Shelton on Friday. 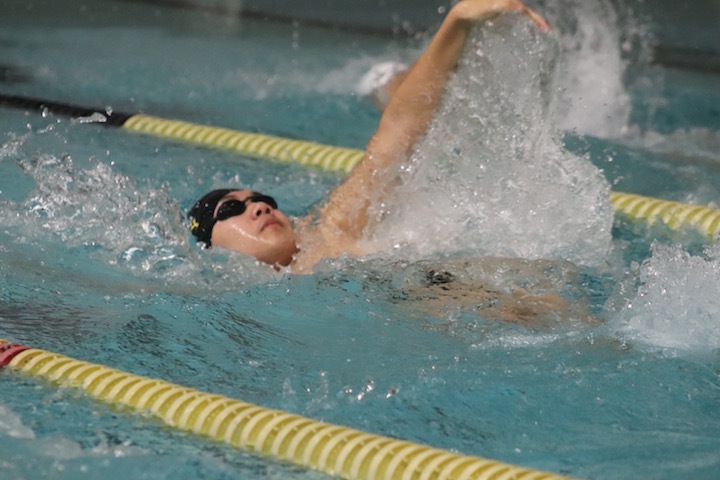 The Shelton Gaels competed well, winning a majority of the events, yet the Amity Spartans outscored them 90-78, winning their seventh regular season meet. The Lady Spartans Girls Basketball team hosted the Branford Hornets in Woodbridge on Tuesday, Feb. 7. It was a rough start for Amity with Branford taking a 4 point lead 14-10 in the first quarter. Amity overcame them by one point 22-21 in the second, then fell behind again, 28-36 in the third. Throughout the game the Lady Spartans were very aware of where their hands were and didn’t have many fouls against them. In the fourth quarter with Branford up by one point 40-39 and just 3:20 remaining on the clock, the Spartans came alive and the Hornets got a little sloppy, pushing and tripping the hometown girls allowing for numerous successful foul shots in the final moments of the game. It was a nailbiter, but Amity came through at the last minute with a 53-40 victory. Branford’s Adrienne DiGioia was the game’s high scoring player with 18 points. 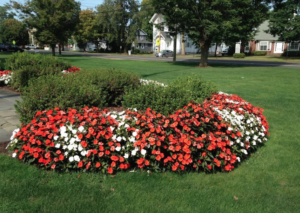 Branford’s pointmakers: Adrienne DiGioia 18, Emma Pierson 13, Sophia Araneo 5, Karly King 2, Autumn McHenry 2.